I’m not sure what it means, but one of the best scenes in Captain America: Civil War doesn’t involve Captain America. It occurs when Robert Downey Jr — in Tony Stark mode — visits Peter Parker (a.k.a. Spider Man) in the young man’s Queens, NY apartment. Downey and Tom Holland (the new Spider Man) play a comic duet in which the older more experienced Stark — or Iron Man — asks for help from a skittish teen-ager who’d rather finish his homework than join a major battle. That’s not to say that Captain America: Civil War shortchanges action, including a pitched battle at the Berlin airport between opposing Avenger factions — the civil war of the title. But even when it’s fighting, the movie often makes room for one-liners that serve as wry commentary on the preposterously swollen nature of what we’re watching. Following an Avengers movie isn’t always an easy task for those who remain uninitiated in the mysteries of Marvel Comics. Every character has a given name — as in Natasha Romanoff — and a superhero name. Romanoff, for example, is Black Widow. And then there’s the task of remembering which actor is playing which Avenger. For the record, Scarlett Johansson portrays Black Widow. Directors Anthony Russo and Joe Russo seem to assume we know all these characters, so he barrels ahead with a movie that mimics some of the concerns raised in the recent — but much less enjoyable — Batman v Superman. As in that movie, we find superheroes struggling with consciences that have been piqued by growing awareness of the collateral damage they’ve wrought. Taking out bad guys creates much debris, some of it lethal to bystanders. At one point, an increasingly tormented Iron Man is confronted by a mother (Alfre Woodard) who lost her son during one of Iron Man’s escapades. Iron Man feels really bad, and Woodard — in small appearance — unloads on him with startling conviction. The suggestion that people actually die and that others are left to grieve is welcome, but unlike the insistently dismal Batman v Superman, a touch of seriousness doesn’t undermine Civil War’s comic-book instincts. Captain America takes a grim turn or two, but it’s still fun. Here’s the gist: Upset by all the damage that the Avengers have caused, the US Secretary of State (William Hurt) decides to rein them in. The Avengers are asked to submit to the rule of a UN panel. Exactly why anyone thinks this will work remains a mystery. Some Avengers agree to the new rules; others rebel against what they view as crippling restraints. 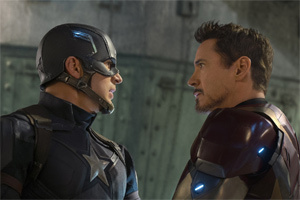 Among those who refuse to accept the new reality are Captain America (Chris Evans) and Falcon (Anthony Mackie). They want to remain independent fighters for ... well ... whatever it is they fight for. Wanda (Elizabeth Olsen) reluctantly goes along with the new order, as does Iron Man. Meanwhile, the villainous Zemo (Daniel Bruhl) wreaks havoc, and Winter Soldier (Sebastian Stans) tries to renounce violence. The Russos move the story with reasonable alacrity, and try to add emotional kick by straining old friendships and dredging up a haunting incident from Iron Man’s past. You’ve probably noticed that I haven’t said much about Evans; maybe that’s because there’s not a whole lot to say about this straightforward guy who plies his trade with all-American efficiency. The movie is named for Captain America, but it belongs to the other Avengers, as well. If you want to be cynical, you could say that the introduction of Spider Man and Chadwick Boseman’s Black Panther are commercial ploys intended to revivify or expand Marvel’s big-screen universe, but Civil War, finally, stands as its own entertainment. Besides, fans may greet each introduction of a character from the Avengers’ roster with satisfying smiles of recognition. Yes, that’s War Machine (Don Cheadle). And look, it’s Jeremy Renner’s Hawkeye. Paul Rudd’s Ant-Man? Yes, he’s there, too. It’s hardly surprising that the Avengers civil war drags on too long or that it assaults us with noisy action and nerve-rattling clangor. But for all that, the big winner in this civil war may be the audience. Captain America isn’t exactly mindless, but it doesn’t let a thought or two stand in the way of anyone’s fun.